Aint nothing like the real thing! I only managed a very brief visit to the plot last bank holiday weekend as we were out of town. Just about enough time needed to harvest a few crops (I’ve already told you of the potato disaster!) and shore up the cucumber support the recent wind had ravaged! As regular as clockwork a couple of courgettes were ready and so I cut those before they grew into marrows. The plant has been far from prolific and I haven’t experienced the oh so familiar glut this year but in a way that’s been perfect for the two of us. If I had a larger family I probably would be a little unimpressed with its yield capabilities but they are very tasty and I have a feeling the plant is going to keep going for a while yet. 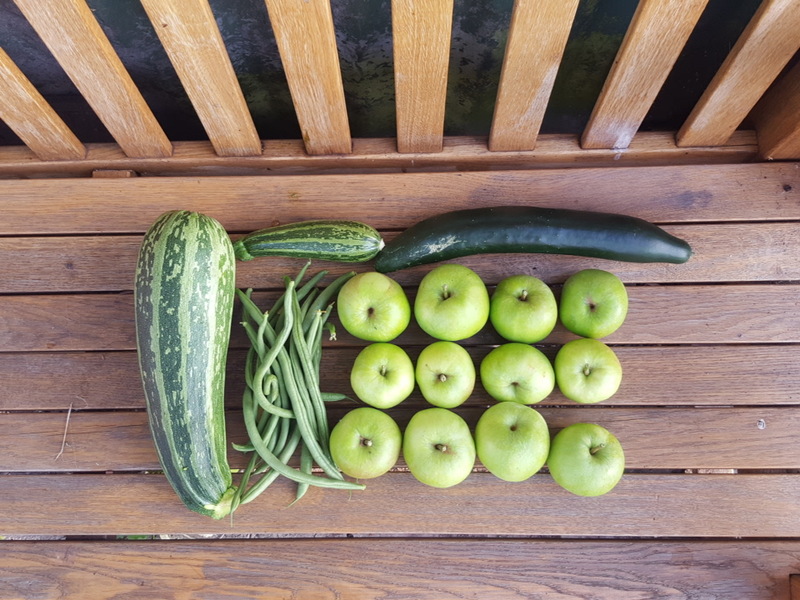 Next in the basket was another cucumber, french beans and the first apples of the year! There was just enough time to plant out a few winter brassica’s but I’ll tell you about that another time!